If you want to go out to eat but don’t know the best restaurants, iPad has you covered. These apps can help you find places based on what type of food you want, how much you want to spend, or even what you’re allergic to. The basic premise of this app is to let you find a restaurant by randomly choosing from various cuisines, price points, and different neighborhoods on three slot machine reels. Shake your iPad (or push the Shake button) to get a random suggestion for where to eat. If you don’t like the result, shake it again. If you want to limit your options, say to a particular neighborhood or a type of food, you can lock one, two, or even all three reels to try to find a particular kind of restaurant. When you get a restaurant you like, just tap its name to open a screen with its address, phone number, kind of restaurant, Urbanspoon user rating, cost rating (indicated by one, two, or three dollar signs), and reviews of the place (where applicable). 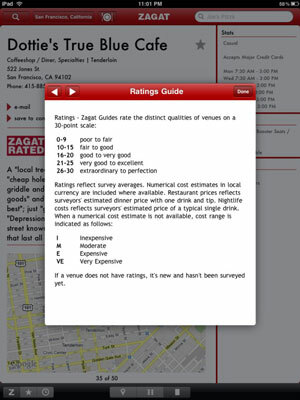 ZAGAT offers reviews compiled by professional editors based on customer surveys, and in an age where budget-constrained newspapers are cutting back on local coverage such as restaurant reviews, ZAGAT is the kind of resource that will only become more valuable as time goes on, especially with iOS devices. 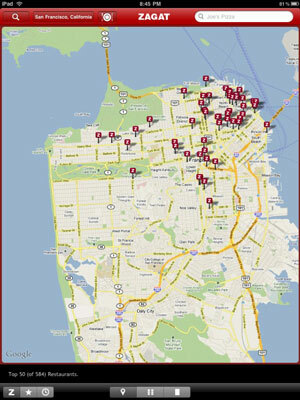 This ZAGAT app gives you access to thousands of restaurant reviews, a GPS-enabled restaurant locator, the ability to search for restaurants according to multiple criteria, and more. This is definitely a must-have app for foodies, and unlike the print version, the app is constantly updated with new reviews. You need a connection to the Internet to make the most use this app; it pulls reviews from the company’s servers. You can, however, view reviews in your History and Favorites without a connection. This app is aimed at a narrow market — those with food allergies or celiac — but for those whom it affects, the topic is important. The app features some 20 different fast-food chains, and for each one, you can enter your food allergens and tap to find menu items you can eat. It tracks nine allergens — eggs, fish, gluten, milk, peanuts, shellfish, soy, tree nuts, and wheat — and you can toggle those in any combination you need. The app includes a subset of 14 chains that provide information relating to gluten content. If you have food allergies and eat fast food, you’ll want this app. Where To Eat? HD is a restaurant finder that uses Google Maps to show you all the restaurants near where you search — and it can use Location Services to figure out where you are. Users can rate restaurants, and those ratings get compiled for all users to see; you can also flag a location as being closed, get directions, and share restaurants via e-mail. The app gives you a couple of ways to browse by category, and includes a tip calculator if you need a little help with the math.